Are PG-245 cartridges as easy to refill as PG-40 carts? 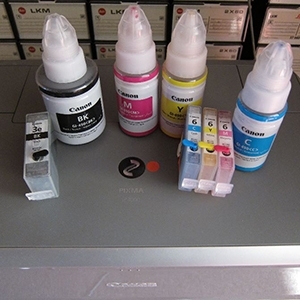 Discussion in 'Canon InkJet Printers' started by zack23, Feb 12, 2019. My wife's old IP1800 printer finally died, and I need to get her a replacement. She uses the printer for black text printing only, and for storage reasons needs a printer that is roughly the same small size as the IP1800 (the width must be less than 9.5", and the height must be less than 6.5"). I'll be refilling her black ink carts. Are the PG-245 ink cartridges used in the current TS202 printer as easy to refill as the previous generation PG-40 cartridges? Do the new cheap Canon printers have an override function that allows them to operate without a functional color cartridge, as the older ones do? Is there any reason I should look for an NOS older generation printer instead of just buying a TS202?